IMAGE: A scanned Lion bar, invented by Allan Norman for Rowntree’s, and first introduced in 1977, in Dorset, image via Scandybars. Food photography is having a cross-sectional moment. From graphic designer Jon Chonko’s scanwiches — sandwiches, cut in half and scanned for “education and delight” — to Nathan Myrhvold’s hi-tech cutaways, we are increasingly able to appreciate the internal architecture of our culinary creations from a perspective that has traditionally only been available to lasagna, cake, terrines, and other foods served in slice format. 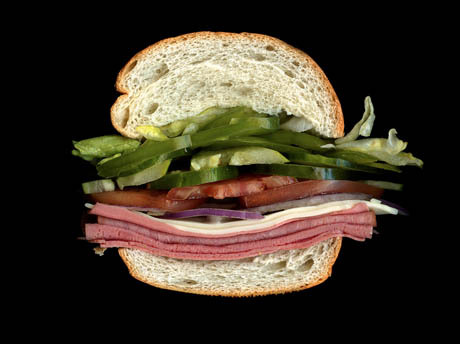 IMAGE: A Subway Cold Cut Combo, via Scanwiches. 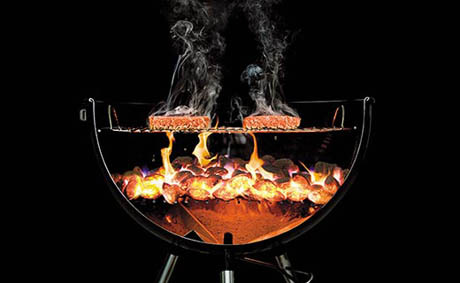 IMAGE: Nathan Myhrvold’s barbecue cutaway. Photo by Ryan Matthew Smith, via The Smithsonian. Yesterday, Grub Street New York drew our attention to Scandybars, which has been scanning its way through the global chocolate bar canon since June. The resulting images are gorgeous — fully deserving of the term “eye-candy” — but they also offer a fascinating insight into the design vocabulary available to a chocolate bar inventor. IMAGE: A scanned 100 Grand bar, via Scandybars. IMAGE: A scanned Baby Ruth bar, via Scandybars. As is the case with biscuit-embossers, the names of the men and women responsible for inventing the world’s most iconic chocolate bars are, for the most part, lost to history. And, like their biscuit-based colleagues, chocolate bar designers work with a limited repertoire of ingredients (nuts, crisped rice, chocolate, biscuit, coconut, nougat, and caramel), manipulated through technological innovation (enrobing, extruding, and moulding machines), to develop a wonderful variety of creamy, crunchy, tongue-coating creations. 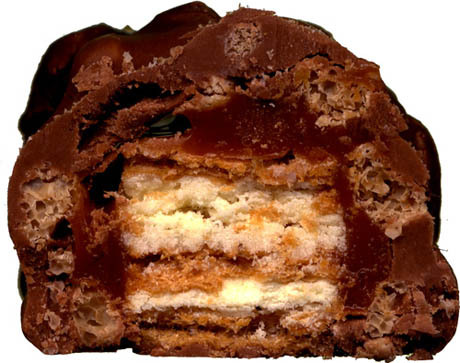 Sometimes the design challenge is practical, as the Twix cross-section below allows us to appreciate. 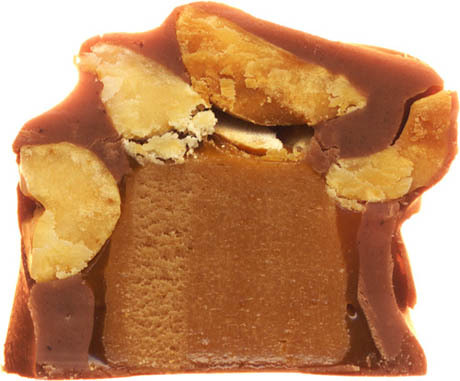 The thin layer of chocolate between the shortbread finger and the caramel topping acts as architectural insulation, preventing water migrating from the caramel into the shortbread and softening it. 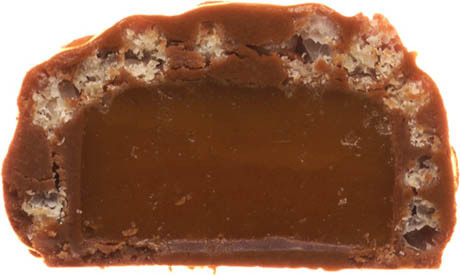 IMAGE: A scanned Twix bar, via Scandybars. The Baby Ruth and 100 Grand bars demonstrate variations on the idea of a crispy/crunchy exterior surrounding a smooth interior, while the Oh Henry! 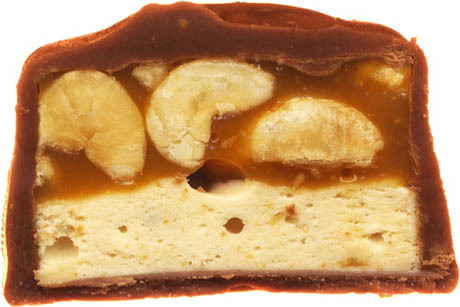 and Snickers bars, below, mix nuts with caramel above a smoother, denser layer of fudge or nougat, with the whole ensemble enrobed in a thin chocolate coating. The Lion bar (shown at the start of the post) combines both approaches, embedding a filled Kit-Kat-style wafer inside a 100 Grand exterior, turducken-style. IMAGE: A scanned Oh Henry! bar, via Scandybars. 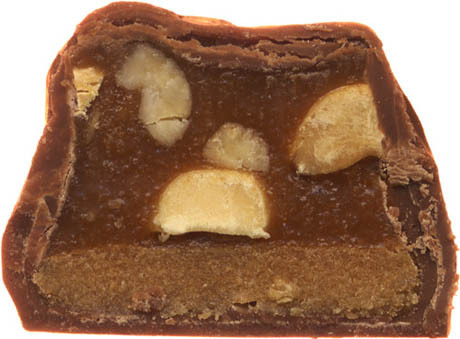 IMAGE: A scanned Snickers bar, via Scandybars. Mouth-feel, texture, taste, and even shareability are among the aspects of consumer experience that can be engineered through permutations of the basic chocolate bar template. The snap-off wafers of a Kit-Kat encourage more leisurely, social consumption, for example, while the interior chewiness of a Snickers creates a perception of satisfaction that the exterior crunch of a 100 Grand bar could never match. As Nathan Myrhvold explains in his TED talk on the subject, the cutaway image is a powerful way to “communicate science, technique, and wonder.” A cross-section encourages viewers to admire the science and technology of food, even — or perhaps especially — when it reveals imperfections in the industrial process, as in the Kit-Kat slip fault below. IMAGE: A scanned four-bar Kit-Kat, via Scandybars. The scanned chocolate bar or cutaway barbecue photo, in other words, foregrounds aspects of our food that we may not have considered before. 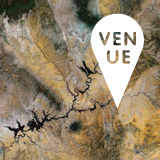 It allows us to re-imagine cuisine as a highly-engineered expression of food, and to appreciate the scientific and creative innovation that brings us everything from perfectly charred burgers to the ever-crumbly Twix biscuit base. A few months ago, I talked to industrial designer Marcelo Coelho, whose prototype 3D candy printer is bringing chocolate bar design into the home kitchen. As he pointed out, you can already find chocolate bars at the grocery store that are made using industrial-scale versions of his extruding device. 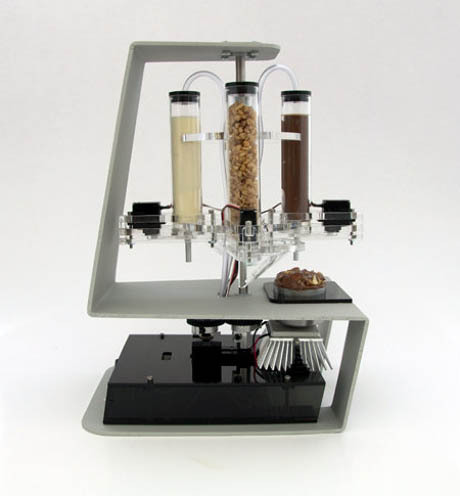 IMAGE: Marcelo Coelho’s prototype 3D candy printer. 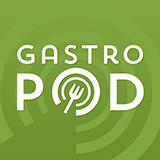 The revolutionary aspect of Coelho’s 3D printer, of Myrhvold’s Modernist Cuisine, and of molecular gastronomy in general is that chefs and amateurs alike are increasingly finding ways to re-create those factory technologies and tools at an individual scale. Just as desktop publishing software and on-demand printing have enabled almost anyone to produce a book, Coelho’s 3D printer would give home cooks the tools to design their own chocolate bar. 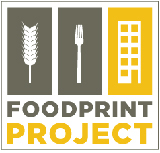 The cross-sectional food photo is both inspiration for and symptom of this movement to re-imagine processed food as something that consumers can examine, understand, and ultimately re-design. In other words, we are all food technologists now. I love this article. since, I was a kid, I have been fascinated by the insides of chocolate candies. My mom told me that when her mother (my grandmother) used to take a toothpick and poke the bottom of a chocolate candy in a box of chocolates to see what color goop came out before she ate it. Even now at this age, I usually bite halfway into a chocolate neatly, to see the inside before I finish it. It’s half the enjoyment. I super love chocolate and I am also the biggest fan of bread, your article, make my mouth water. Thank you for this, and for bringing Scandybars to my attention. As a kid I was very curious about the insides of chocolate bars; I used to try to cut or bite them in such a way as to present as clean a cross-section as possible. Needless to say, the results were crude at best. This post would have made my mouth water had I not just devoured a pain au chocolat. And I must say I’m very amused by the wonky Kit-Kat.